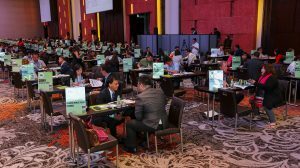 Foreign travel agents from all over the world are coming over for the Philippine Travel Exchange (PHITEX) now meticulously being organized by the Tourism Promotions Board (TPB) for staging on August 29 to September 5. TPB Chief Operating Officer Cesar Montano said those foreign buyers had confirmed their participation in the whole-day, one-on-one business meetings with local sellers on August 30 and 31. “The B2B (business-to-business) meetings dubbed as ‘TRAVEX’ (Travel Exchange) will enable our local sellers of travel packages to get included in the product portfolio being promoted by the foreign buyers to their outbound clients in their respective home countries,” Montano pointed out. “Thus, we offer post-event tours for the foreign buyers to give them experiential knowledge of why it is more fun in the Philippines, thereby enabling our tourism destinations to get promoted and marketed without our local sellers having to travel abroad,” Montano explained. Joining TRAVEX 2017 are buyers from Korea, China, Japan, Taiwan, United States, Germany, Australia, New Zealand, Hong Kong, Malaysia, Singapore, Canada, United Kingdom, Middle East, Russia, India, and other European and Southeast Asian countries. This year, the post-event tours scheduled on September 1-4 will be in the Ilocos region, Tagaytay-Batangas, Albay-Sorsogon, Iloilo-Guimaras-Bacolod, Puerto Princesa, Coron, Cebu-Bohol and Dumaguete-Siquijor-Sumilon island chains. The tours will be preceded by a cocktail reception on the previous night, which also caps a half-day seminar for the local sellers. Seminar topics include sustainable tourism, crisis mitigation and marketing in unfavorable times, and travel market trends and forecasts. “The seminar is aimed at helping the local sellers design their product development programs according to actual market demand and the evolving consumer preferences in various parts of the world,” Montano said. “As such, the event contributes to our pursuit of tourism excellence at both ends of the value chain, or both the demand and supply side, with the TPB helping bridge any gap between the two via advocacy,” Montano added. “It (event) also gives us aspirational inputs for use in setting quality benchmarks even in domestic tourism, raising the bar of professionalism in the industry, and aligning our marketing and infrastructure development strategies with current and evolving global market priorities. This is the reason why TRAVEX is essentially and necessarily an annual event,” Montano stressed. To know more about PHITEX 2017, visit www.phitex.ph.